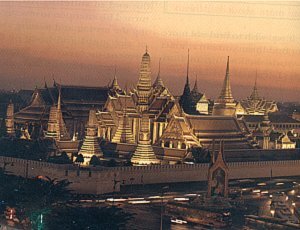 Wat phra Kaeo, the official name of Wat Phra Si Rattanasatsadaram or The temple of the Emerald Buddha, adjoins the Grand Palace, on common ground which was consecrated in 1782, the first year of Bangkok rule. The 945,000 square-metre compound encompasses over 100 buildings that represent 200 years of royal history and architectural experimentation. 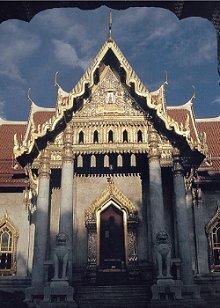 Most of the architecture can be classified as Bangkok or Rattanakosin style. Wat Pho or Wat Phra Chetuphon, the oldest and largest wat in Bangkok, was built in the 16th century during the Ayutthaya period and then almost completely rebuilt in 1781 by King Rama I. It features the huge reclining Buddha and the largest collection of Buddha images in Thailand and was the earliest centre for public education. This Wat is made of write Carrana marble so hence its tourist name, Marble Temple. 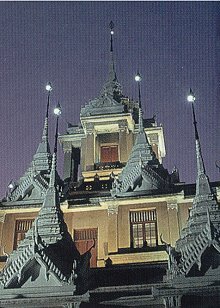 The Wat, the most recent of royal Wats, was built at the turn of the century under King Rama V. The largest Bot, in the compound, is a prime example of modern Thai architecture. The courtyard behind the Bot exhibits 53 Buddha images (33 originals and 20 copies), representing famous images and styles from all over Asia, Thailand and other Buddhist countries. It is an excellent place to watch religious festivals and moonlit processions. Unlike most other temples, monks don't go out seeking alms but are instead visited by merit-makers between 06:00 and 07:00 hours. Wat Saket is an undistinguished temple, except for the Golden Mountain or Phu Khao Thong on the West side of the Golden Mountain, puts everything back in perspective and offers views over Rattanakosin Island that are simply stunning. 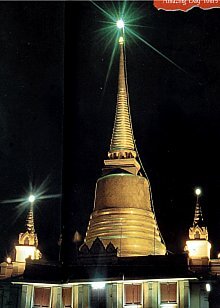 The artificial hill was created when a large Chedi under construction by King Rama III collapsed because the soft soil beneath would not support it. The resulting mud-and-brick hill was left to sprout weeds until King Rama IV built a small Chedi on its crest. King Rama V later added to the structure and housed a Buddha relic from India in the Chedi. The concrete walls were added during World War II to prevent the hill from eroding. 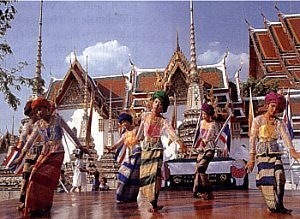 Every November a large festival, held on the ground of Wat Saket, includes a candlelight procession up the Golden Mountain. Across Mahachai road from Wat Saket is Wat Ratchanatda. This temple dates from the mid 19th century. Built under King RamIII's reign, it is an unusual specimen, possibly influenced by Burmese models. The Wat has a well-known market selling Buddhist amulets or magic charms in all sizes, shapes and styles.The amulets not only feature images of the Buddha, but also famous Thai monks and Indian deities. Full Buddha images are also on sale. In Thai, Buddhas or Phra Phim are never "bought" or "sold", they are "rented". The images are believed to protect the wearer from physical harm, though some only act as "love charms". Amulets that are considered to be particularly powerful tend to cost thousands of baht and Wat Ratchanadda is an expensive place to purchase a charm, but a good place to look around. Wat Bowonniwet is the national headquarters for the Thammayut monastic sect, the minority sect Mahanikai Buddhism. King Mongkut, founder of the Thammayuts, began a royal tradition by residing here as a monk and was in fact, the abbot of this Wat for several years. King Bhumibol Adulyadej (Rama IX) and Crown Prince Vajiralongkorn, as well as several other males in the royal family, have temporarily ordained as monks here. 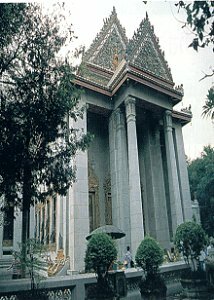 The temple was founded in 1826, when it was known as Wat Mai.